2018 Ocean Discovery campers touching sea creatures at the Aquarium Outfitters store in Athens, GA on our camp field trip. Photo courtesy of UGA's Summer Academy. Camp will be held through the University of Georgia's summer academy - registration is now open! The third year of our Ocean Discovery Camp was a huge success!! We partnered with the University of Georgia's summer academy again, and enjoyed using the Science Learning Center on UGA's main campus! 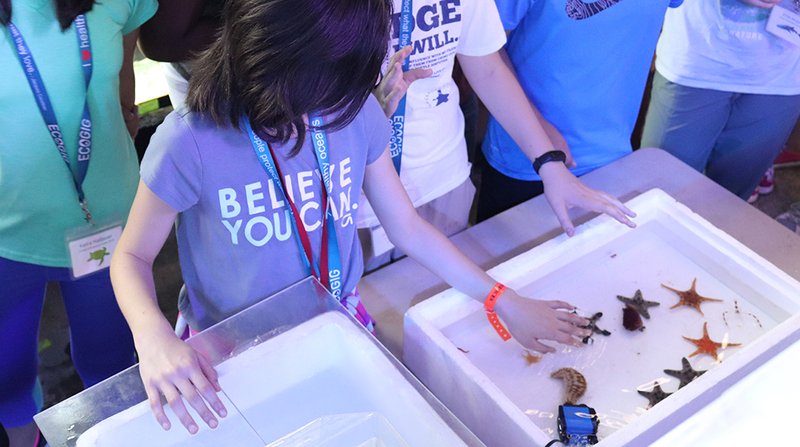 Our campers (ages 11-14) explored a number of ocean-themed topics through hands-on projects, crafts (tubeworms! sea turtles! trash monsters! ), games, videos & photo slideshows. The topics we visited at camp included the ways we explore the deep oceans, amazing ocean ecosystems, chemosynthetic processes and communities & threats to our oceans such as plastic pollution, oil spills & climate change. This year camp was held during World Ocean's Week so we tried to make it a special week, and included a field trip to our local aquarium store and a day dedicated to plastic pollution in the oceans, the theme for this year's World Oceans Day. Ocean Discovery campers designed and built their own ROVs (Remotely Operated Vehicles) and test drove them in the pool! The controllers for their ROVs are available for purchase online here. Our campers also created PSA videos based on some of the ocean topics we touched on throughout the camp! A big thank you to everyone who helped to make the Ocean Discovery Camp a success again this year!! The second year of our Ocean Discovery Camp was a huge success!! We partnered with the University of Georgia's summer academy and our campers got to be the first camp held in the new Science Learning Center on campus! Our campers (ages 11-14) explored a number of ocean-themed topics through hands-on projects, crafts (yarn octopus! tubeworms! sea turtles! ), games, videos & photo slideshows. The topics we visited at camp included the ways we explore the deep oceans, amazing ocean ecosystems, chemosynthetic processes and communities & threats to our oceans such as plastic pollution, oil spills & climate change. Ocean Discovery campers designed and built their own ROVs (Remotely Operated Vehicles) and even raced them at the end of camp! The controllers for their ROVs are available for purchase online here. You can watch a short video of their ROVs in action in our video gallery! Our campers also created stop motion videos based on some of the ocean topics we touched on throughout the camp- we had a creative bunch of campers who produced some amazing works of art! They are vieweable online and in our video gallery! A big thank you to everyone who helped to make the Ocean Discovery Camp a big success again this year!! The inaugural 2016 Ocean Discovery Camp was a huge success - our campers had a great time while becoming young ocean experts. Ocean Discovery campers explored a number of ocean-themed topics through hands-on projects, crafts, games, and presentations. The topics we visited at camp included tools and technology used in deep ocean exploration, features of amazing deepwater ecosystems in our oceans, the arctic ocean ecosystem, sounds in the ocean & threats to our oceans such as plastic pollution, oil spills & climate change. Ocean Discovery campers learned to build working mini-ROVs (Remotely Operated Vehicles) and test drove them -- all ROVs built at camp were successfully operational!! The kits used at camp are available for purchase from Apogee Kits here. We are grateful for everyone who participated in and helped to make our first ever Ocean Discovery Camp a big success! !